When I was preparing my October budget I suddenly realized that I had hit a cool and important milestone. That milestone was the fact that I had finally achieved a positive net worth. For those not familiar with the term of net worth, it’s basically taking all your assets and subtracting all of your liabilities from that total. The resulting number is your net worth. Assets consist of things like money in your savings, checking account, any property you own, and any money in your retirement accounts. Liabilities consist of things like any outstanding debt such as a mortgage, student loan debt, or an auto loan. There are plenty of other things that can factor in as well, but these are the major items that most people will have. 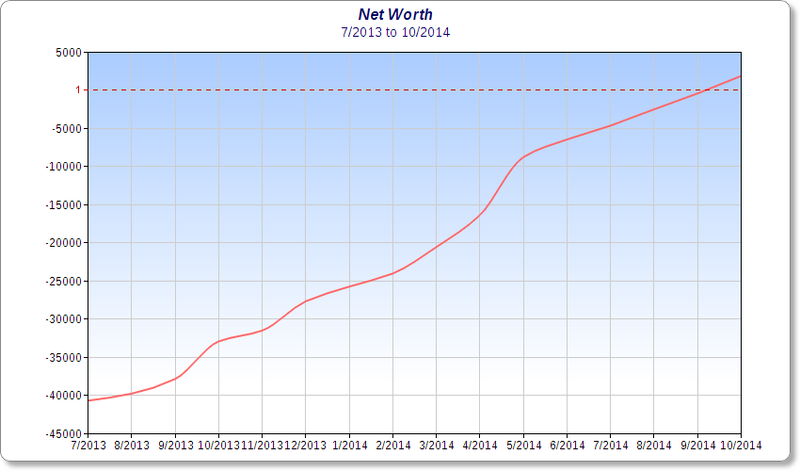 This is the first time since 2007 that I will actually have a positive net worth, and it feels really good. 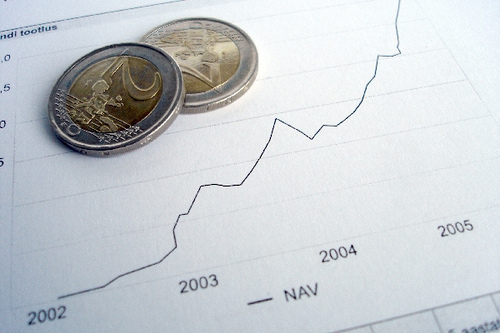 The reason that I had a positive net worth back in 2007? That was a much simpler time, before I even had any student loans! It’s funny how quickly things can change as I went from having a few thousand dollars to my name, to suddenly having tens of thousands of dollars in debt. Obviously this was an important investment in my future but it’s nice to finally be turning the corner. I’ve tried to plot out my net worth as far back as I could, but I’ve only been using the same method to keep track of it for about a year now. While it would be cool to see the entire history of my net worth dropping through college and then slowing increasing, you should still be able to see the general pattern through this chart. You can see that I’ve been able to make fairly steady progress since July of last year, which is very close to when I started blogging. I started around April but I only had official net worth numbers that went back to July. The spike in September 2013 came from a huge payment on my student loans, with another spike occurring from March 2014 to May 2014. This came from receiving my bonus at work, my tax return, and then updating the numbers on my retirement accounts for my mid-year update. After that last spike it’s been slow and steady space from June going forward until today. I’m currently factoring in my pension as part of my net worth, but I know that sort of thing is never guaranteed. There are some protections around pensions but once I start actually calculating for retirement I will do several different “sets” of calculations without my pension, without social security, etc. I also have not factored in my car as part of my net worth, and if I did that too I probably would have had a positive net worth last month. I have no intentions of selling my car but if I had to sell it to pay off one my loans, it would be a potential increase to my net worth by about $3000-$4000. I’m hoping that this a turning point in my finances and that I’ll never see a negative net worth again in my lifetime. Obviously this could change in the next few months if the market crashes as I’m hovering just barely at a positive net worth, but I think with my monthly loan payments they should be able to keep me afloat and in the black. The only item that I can see pushing me towards a negative net worth is a mortgage, but that is still a ways off. Onward and upward from here! Congrats. Thank you! Hoping that it is only upward from this point on. Thank you 🙂 And absolutely – that’s the only direction it’s headed in now. That’s an even longer wait, I’m not sure if I would have been able to handle that! It’s nice that now you are in the positive the gains you are making truly feel like gains now.